Today's press giving the premise of Arrow episode 2.09, "Three Ghosts" pretty much confirms that fact that one of Brother Blood's drugged up acolytes from last night's episode is Cyrus Gold and, as some fans know, Cyrus Gold IS Solomon Grundy. Read the release yourself after the jump..
OLIVER IS VISITED BY GHOSTS FROM THE PAST — After a fight with Cyrus Gold AKA the Acolyte (guest star Graham Shiels), Oliver (Stephen Amell) is drugged and left for dead. Determined to cure him, Felicity (Emily Bett Rickards) makes a risky decision. The cure causes Oliver to hallucinate, and what he sees forces him to confront his past. Meanwhile, Barry (guest star Grant Gustin) continues to help Felicity, and their connection grows stronger. The Arrow asks Lance (Paul Blackthorne) to look into Gold, but when the stakeout on Gold goes bad, someone is killed. Roy (Colton Haynes) is captured and tortured by Brother Blood (guest star Kevin Alejandro). John Behring directed the episode with story by Greg Berlanti & Andrew Kresiberg and teleplay by Geoff Johns & Ben Sokolowski (#209). Gold is portrayed by Graham Shiels (True Blood) and is most likely the guy who is going to be killed when the stakeout goes bad. 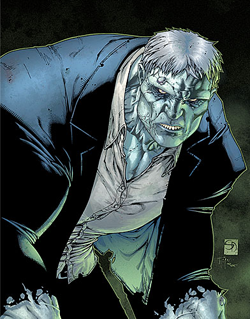 My guess is they'll dump his body in the glades somewhere and, at some point, we will see the reanimated body of Gold turned into the zombie that is Solomon Grundy. This is a big step forward for Arrow...it certainly goes away from the Nolanesque reality-based show. What are your thoughts? Is Gorilla Grodd far behind? Sweet Pappy Johnson I hope they add Grodd!